Place the chickpeas on a baking sheet. Sprinkle them with the oil and half of the cumin. Stir the chickpeas until evenly dredged in oil and cumin. Sprinkle the remaining 1/4 teaspoon of cumin over the chickpeas. Once the oven is preheated, bake the prepared chickpeas for 10-20 minutes, depending on their size and how crispy you like them. We like them very crispy and we keep them in the oven for 15 minutes. We shake the pan about half way through baking time and rotate the sheet to make sure they’re baking evenly. They tend to dry out a bit when baked for so long but we like them that way. They’re also nice just slightly warmed but can be a little bit oily if they’re not baked for at least 10 minutes. Meanwhile, place baby arugula or salad greens in a large bowl. You may want to chop it into bite-sized chunks first if the greens are normal-sized or really toddler sized marketed as baby sized. Toss in the quartered cherry tomatoes, cubed or sliced avocado, and grated carrot. You can also toss in the grated beet at this point if you don’t mind it staining the rest of the salad. Otherwise, hold off and add it in later, as you plate the salad. While waiting for the chickpeas to finish baking, you can dress the salad. We generally don’t mix the dressing separately but rather add in olive oil, red wine vinegar, and lemon juice to taste. You may want to use more or less of each of the dressing ingredients, depending on how potent yours are on their own and which taste you prefer to shine through the most. A couple of minutes before the chickpeas are ready, plate the salad. Sprinkle each plate with half of the crispy chickpeas. If you prefer them to be evenly distributed in the salad and don’t mind them losing some of their crispiness, you can toss them in the salad before plating. Sprinkle each plate with half of the sunflower seed kernels and half of the pine nuts. Serve immediately. If using canned chickpeas, check the nutritional labels and choose the kind that has the least amount of sodium. We use organic chickpeas because they have less sodium than the non-organic low sodium option. 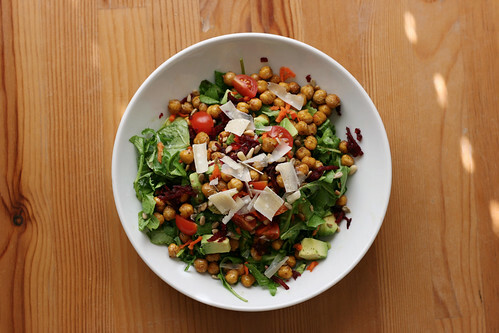 If you soak your own chickpeas and don’t add any salt to the water, the salad will have negligible amounts of sodium. If you’re not strict about your sodium intake, add a pinch of salt to the chickpeas along with the olive oil and cumin. Use salted sunflower seed kernels, which, for some reason, are much tastier than their unsalted counterparts. We always buy organic carrots because they taste sweeter than non-organic carrots. If you don’t use organic carrots, I would recommend peeling them before grating them. We also always buy organic tomatoes for salad because they’re tastier. Cherry tomatoes have a really nice subtle tanginess that they add to the salad. I like grape tomatoes and heirloom tomatoes in this salad as well. If I don’t have any of those and I don’t have really ripe regular tomatoes, I skip the tomato all together. Also, one thing that I learned far too late in life is that tomatoes should never, ever be refrigerated. They lose their flavor and become mealy when refrigerated. We almost always have baby arugula on hand. We love it so much, we planted our own in a pot on our balcony and are anxiously awaiting to harvest it. Other greens we eat when we’re arugula-ed out are baby kale, baby spinach, and a salad mix we sometimes buy which has baby kale and other assorted greens. A tasty, non-vegan, not very low-sodium addition is sprinkling with thinly sliced parmesan cheese. Having a sharp, heavy-duty grater will make your life a lot easier when grating hard things like carrots and beets. We have the Rosle medium grater , which was a bit of a splurge, but totally worth it for us because we use it almost daily. The plate doesn’t bend when grating hard things, the curved base makes it easy to grate over a bowl, and the covered feet make it easy to grate over a plate or cutting board.